Andy Peaks felt it was a case of mission accomplished for in-form AFC Rushden & Diamonds as they booked their place in the second qualifying round of the FA Cup. Diamonds made it six wins in a row in all competitions as they claimed a 2-1 victory at Combined Counties League Division One side Bedfont & Feltham on Saturday. But it wasn’t always plain sailing for the Evo-Stik Southern League Division One Central leaders. 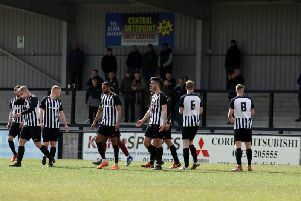 Dan Quigley scored both goals to send them through but goalkeeper Matt Finlay saved a penalty along the way while both teams finished with 10 men as Jack Ashton saw red for Diamonds in the second period. And Peaks was pleased to see his team avoid a “banana skin” and seal a place alongside the Vanarama National League North and South clubs in tomorrow (Monday) lunchtime’s draw. “We always felt if we started well we could get out of sight and we did create chances,” the Diamonds boss said. “We got the goal but then we gave them a lift with the penalty and then the goal. “But we came out and did the job in the second half and it’s a good result. “We will look forward to the draw. “This was a bit of a banana skin for us and we knew it would be tough. “It was exactly what I expected, it was a tough place to go. “But the main aim of the day was to make sure we were in the hat and that’s what we have done.